The JobShopLEAN Conference held on July 10-12, 2012 at The Ohio State University was a fabulous opportunity for professionals in various industries to meet and learn from each other. 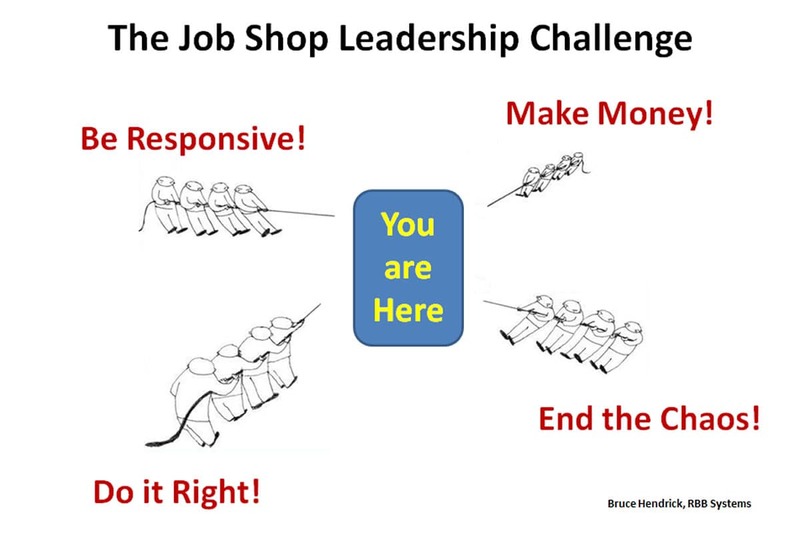 When one of the conference speakers withdrew, I was honored to step in and share a few thoughts on leadership in job shop environments. Over the next few blog entries, I will touch on the highlights of this presentation. While good leaders can be effective just about anywhere, after working in three completely different industries (pressure sensitive adhesives, ceramic tile, and now contract electronics) I have learned the hard way that there are particular skills needed to thrive in these high mix, low volume, made-to-order settings. “We will honor and respect the past, but we will not live in it.” So read one of the wedding vows that my wife Donna and I pledged to each other twenty years ago. As a second marriage for both of us, we went out of our way to acknowledge the legitimacy of our previous lives, but also to commit to each other not to perpetuate patterns of behavior that had made us unhappy! A very common job shop world story is that we grow as far and as fast as our customers let us. We pride ourselves on our willingness to say “yes, we can do that” and then morph our equipment, people, and facilities to accommodate the new solutions that we’ve just created. So, evolving customer needs naturally drive the responsive job shop to expand its capabilities. Just under the surface of this seemingly noble progression is often profound paranoia, which usually sounds like: “If we don’t satisfy all of this customer’s needs, then we may very well lose them altogether. Since we obviously can’t afford that, let’s just do this new thing and figure out how to make money at it later.” Over time we can develop a hodgepodge of loosely connected competencies, not all of which are reliably profitable. While I agree with Intel’s former boss Andy Grove who famously said “only the paranoid survive”, and who wrote a book by that name, many job shops grow (and shrink) with their customers without ever really setting a strategy or direction for their firms. “We do what our customers want” can be palatable camouflage for “we don’t know really know where we’re going.” They become the ultimate catcher in baseball: able to field any pitch thrown. Flexibility, resourcefulness and resiliency are hallmarks of all good job shops, yet the leaders of the vibrant ones I’ve encountered all understand that this isn’t nearly enough. They know specifically why their customers call them and not their competitors. They concede certain pieces of business to other players or channels so they can focus on what they do best. Their sales process is just as efficient as saying “no, thank you” as it is in discovering good opportunity. Companies large and small have developed their Mission Statement, Purpose, Vision, and Values years ago. Forgive me but I find most to be boring, watered down, over-edited and unusable for the typical employee or business decision. Many can be translated to “We do it all and our people are awesome.” No wonder it’s difficult to lead. Every ethical path is valid. All opinions are justifiable. These “corporate” statements are fine, but what strong job shops really need is the courage to be great at some things and less so at other things. They need a beacon to illuminate their path and differentiate it from the others. Of course we must flex to meet ever-changing demands or risk certain obsolescence… but these should be conscious changes in bearing or strategy – not directionless evolution. There is tremendous power in the ability to say “no”! By way of example, RBB’s somewhat bold tagline is “The Premiere Electronics Job Shop” and our Mission says simply: We exist to move heaven and earth to get our small batch customers what they want, when they want it. Prospects, customers, and employees alike understand at a glance that “creative hustle” is routine, no exceptions. Small batches, and not large ones, are what we are about. When we get opportunities for high volume work we either negotiate for cost-effective “bite-size” batches or refer the work to more suitable partners (former competitors). Yes, really. Notice that people at all levels need only check the Mission to make the right business decision. In summary, healthy job shops have a clear path that others in their industry recognize. It may not be uncontested, but it is nonetheless tangible and easily understood by everyone. Next time, in Part 2 of this series, we will discuss the need for not just a path but a destination. We welcome your reactions and feedback!